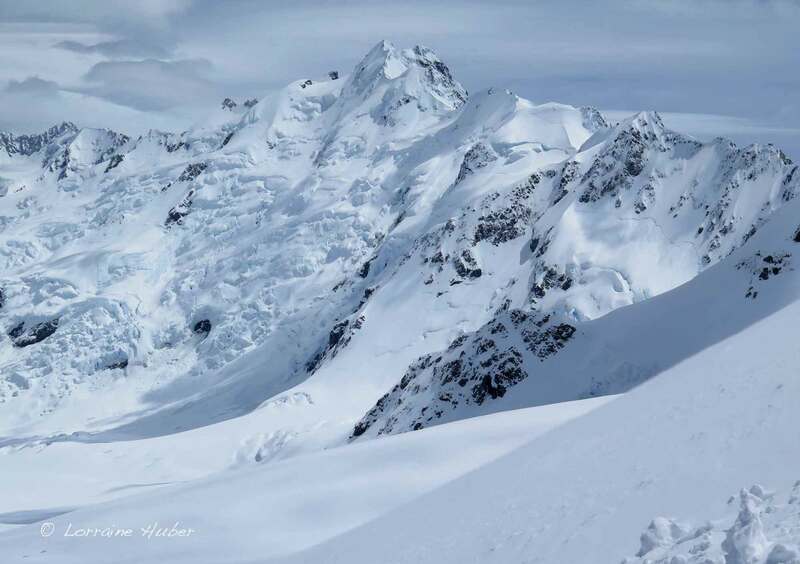 Getting into more serious ski mountaineering has always been on my list, but it was mostly ranked behind my freeride skiing and sport climbing. 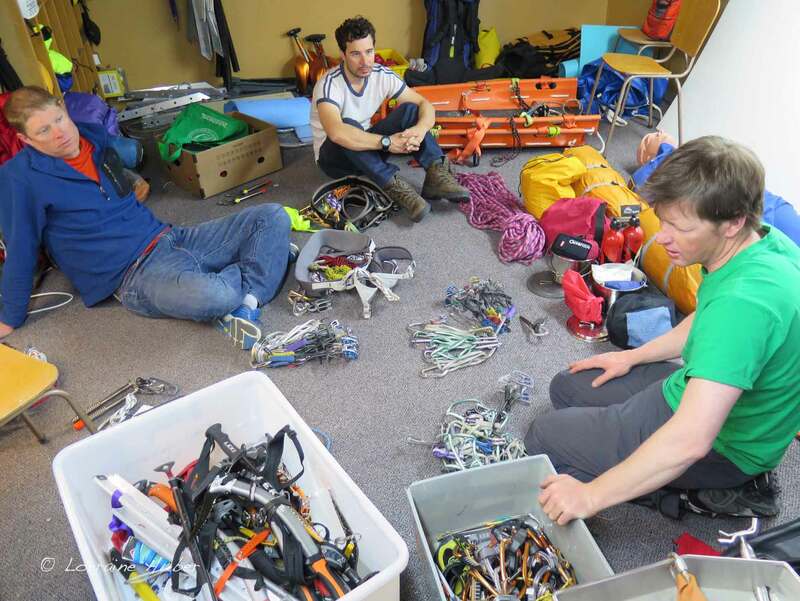 Last year, I decided that if I really want to get into ski mountaineering and become an equal rope partner on the mountain, it’s time to refresh some technical skills and learn the ones I’m still lacking. 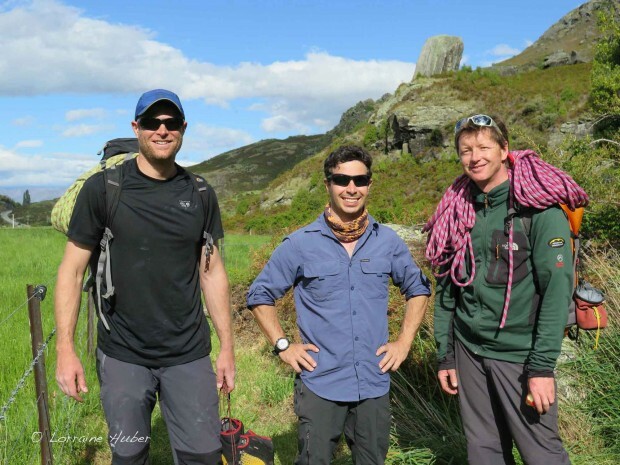 After some research on Google, I soon found what I was looking for: the ‘Alpine Expedition Course’ with Adventure Consultants from Wanaka, New Zealand. 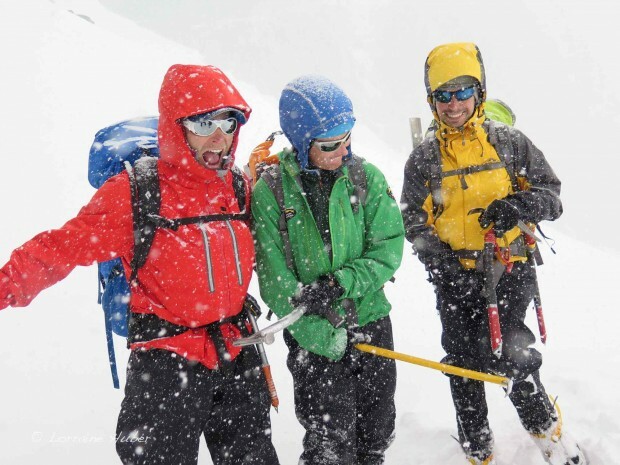 Managed by mountaineering legend Guy Cotter, Adventure Consultants is a world-renowned mountain guiding company with a legacy of climbing expeditions to the world’s highest peaks, and wilderness treks to the more remote corners of the globe. The also offer a comprehensive course Program in New Zealand, Europe, and North America. 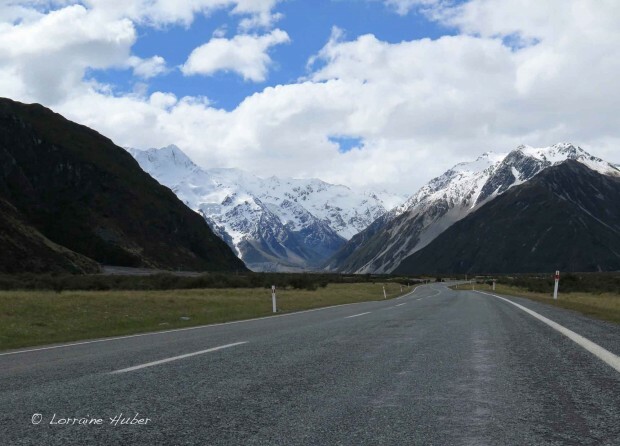 A couple of months later, I found myself on route to the beautiful lakeside town of Wanaka, where I had spent a couple of winter seasons four years earlier. In a way, it felt like coming home. Shortly after my arrival, I was on the way to the AC HQ. There I met the other course participants and my guide Jono Gillan, who was to become the funniest but also most competent teacher I could have wished for. I was pleased to find out that we were a small group of only three participants: Denis, a successful and highly intelligent engineer from Brisbane, Australia, T.J., an officer in the U.S. navy who flies in F18F fighter jets and is trained to be as deadly as possible, and myself. After some slightly nervous first introductions, gear and weather check, comes the news: there’s weather coming in from the SW, we wont be locating to the Remarkables mountains in Queenstown today, but doing some rock climbing at Hospital Flat in Wanaka instead. Soon, I was climbing my first routes in leather mountaineering boots, a very strange feeling indeed. With his 90 kilos, T.J. seemed comfortable enough for me to belay him. T.J., Denis and I were checking each other out, trying to gage how we would fit together during the course. After all, we would be spending the next 12 days together, and in close quarters too. It soon became apparent though that we’re going to make a great team. Jono seemed impressed with our climbing level, which made us feel very good about ourselves. Remarkables was on the plan the next day. With almost hyperactive energy levels, Jono shows us the ins and outs of correct crampon and self-arresting technique, and building snow anchors. 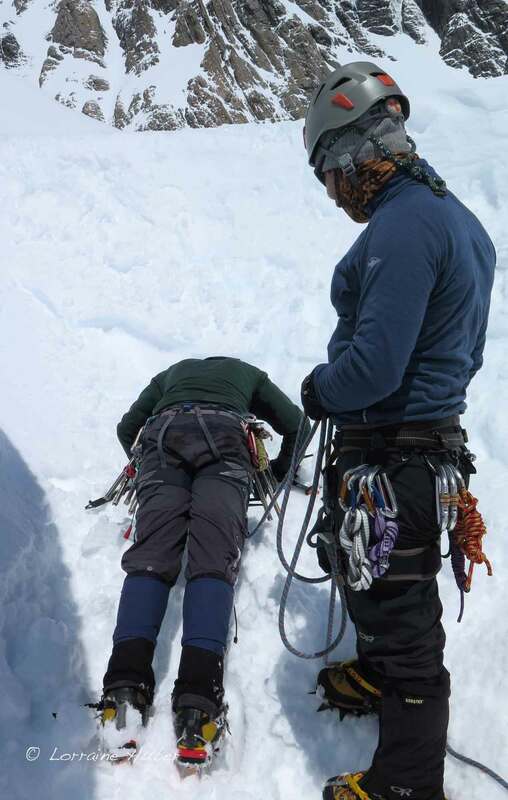 Then it started dumping, so we decide to head down and cover some theory: roping up on the glacier and pulley systems. Especially Jono’s clear explanation of pulley system theory was incredibly valuable. In no time, I was building and combining 2:1 and 3:1 pulley systems with more clarity and confidence then I’d ever had. That night, we cover how to plan food for an expedition and pack everything required for a full week spent in a hut in a very remote location. The following day, we drive towards Mt. 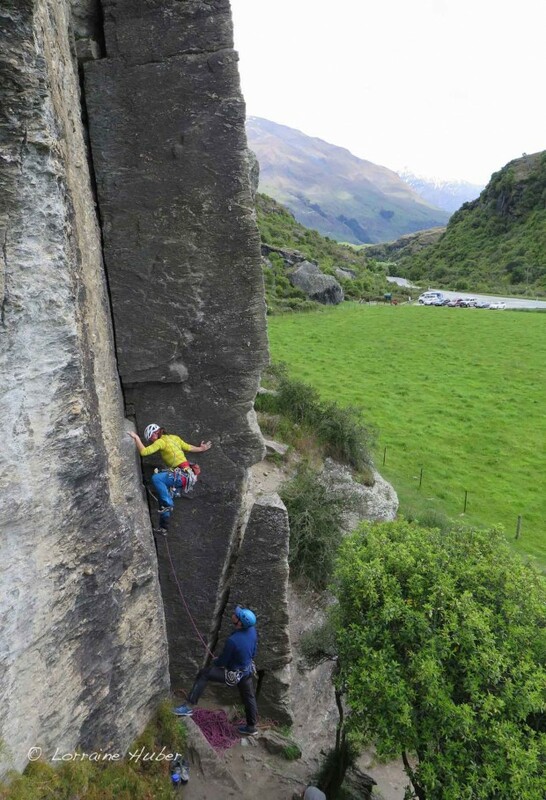 Cook village, check into our accommodation for the night and head out to climb one of Jono’s favourite routes on Sebastapol Bluffs, the only crag in New Zealand with true multi-pitch within 10 minutes of the carpark. 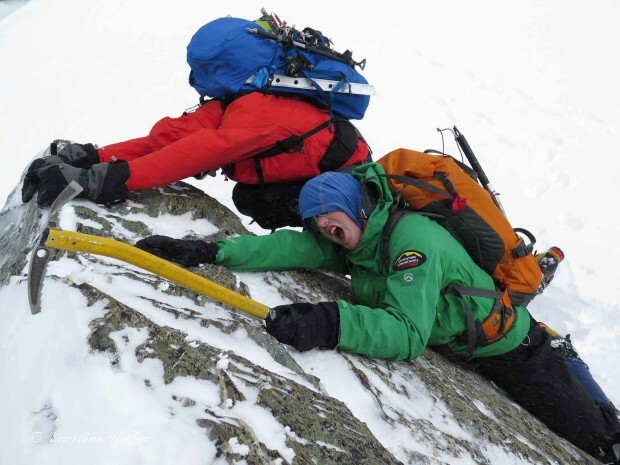 To challenge ourselves, we choose to climb in our mountaineering boots. Still feels weird. 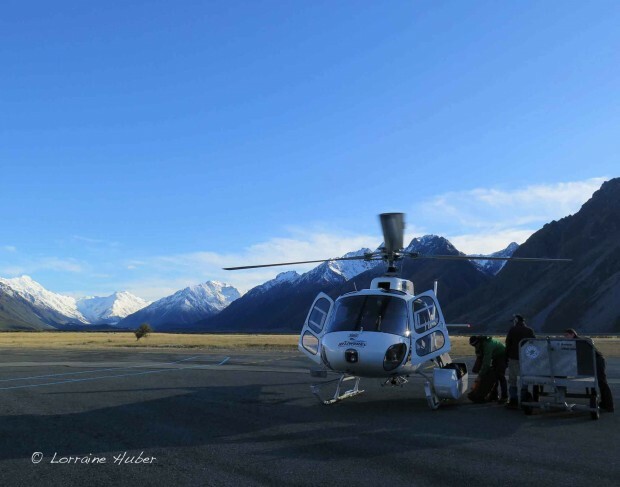 At the crack of dawn next morning, we’re up and preparing to fly via helicopter to Tasman Saddle Hut. The weather report had been correct and finally the sky was clear. 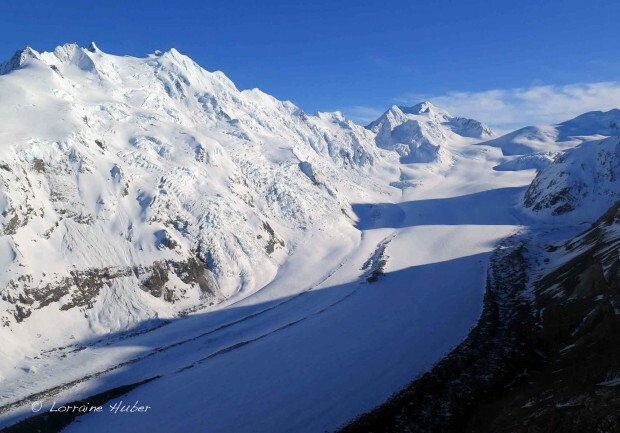 The flight over the 27 km long Tasman Glacier is awe-inspiring. I’m immediately struck by the seriousness of the mountains flanking the Tasman. 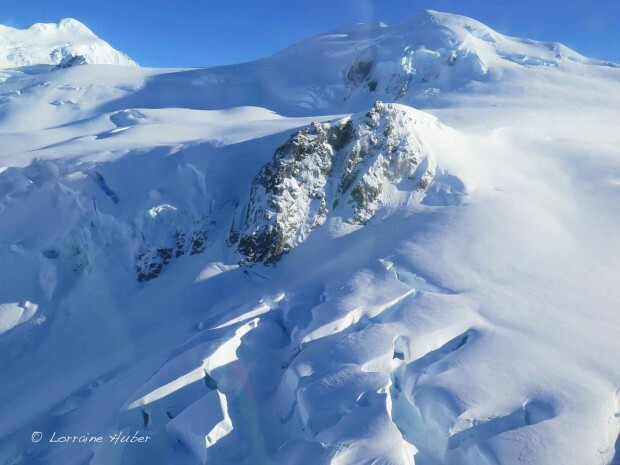 Although not particularly high, they look like Himalayan mountains with their steep and heavily crevassed flanks and precariously balanced ice seracs just waiting to peel off the mountainside at any time. I begin to understand why climbing Mt. Cook is so dangerous. Our home for the week, the Tasman Saddle Hut at 2300m, is perched on a death ridge with huge seracs on one side and a sheer, vertical rock wall on the other. 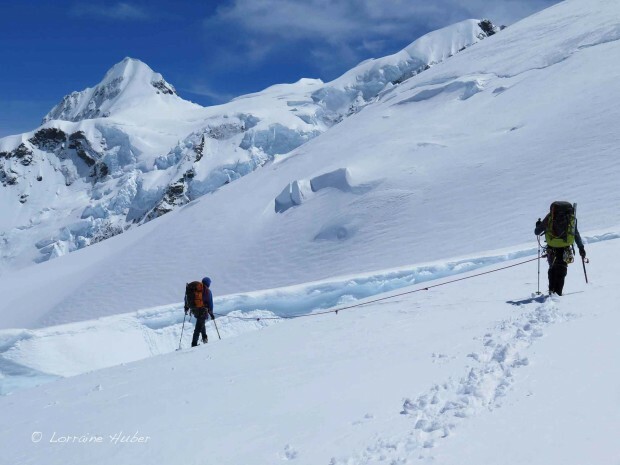 Walking carefully over the icy snow, we carry all our supplies and gear down to the hut from the landing zone. 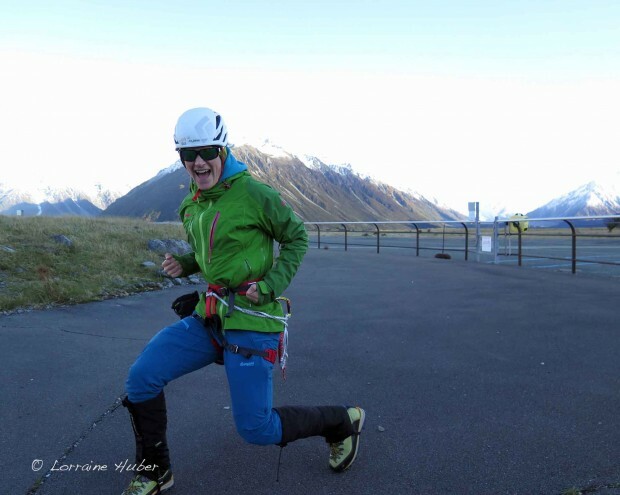 But first, Jono tells us about an experienced climber who died here last year after slipping and falling to his death carrying a box laden with food down to the hut. 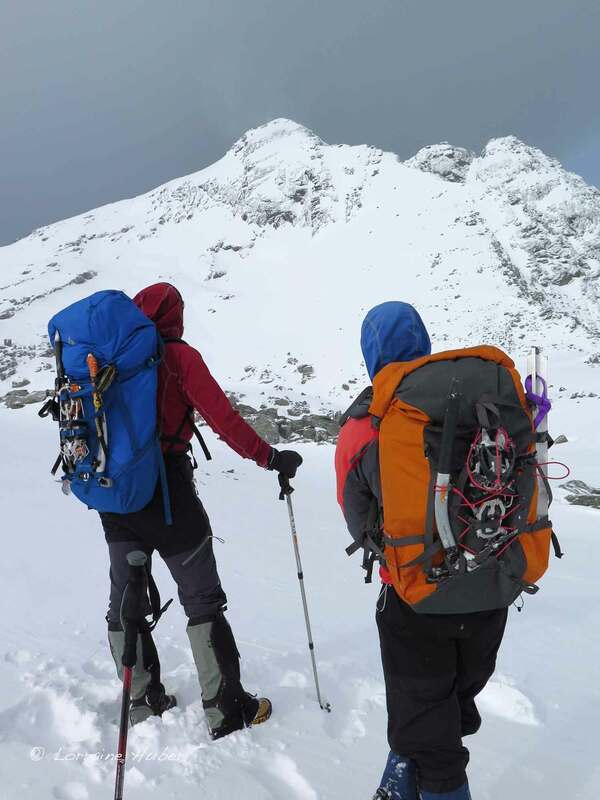 We put on our crampons and carry only one item at a time. Then we gear up to make use of the remaining good weather. We head towards Hochstetter Dome while getting interesting insight to correct rope travel and route finding through glaciated terrain. Streaks or so-called “angry bird” clouds (at least that’s what Jono calls them) warn us of oncoming bad weather and we decide to head back to the hut, the Hochstetter Dome left unclimbed behind us. For the following 48 hours, 200 km/hr winds, freezing temperatures and 50 cm of new snow was the order. 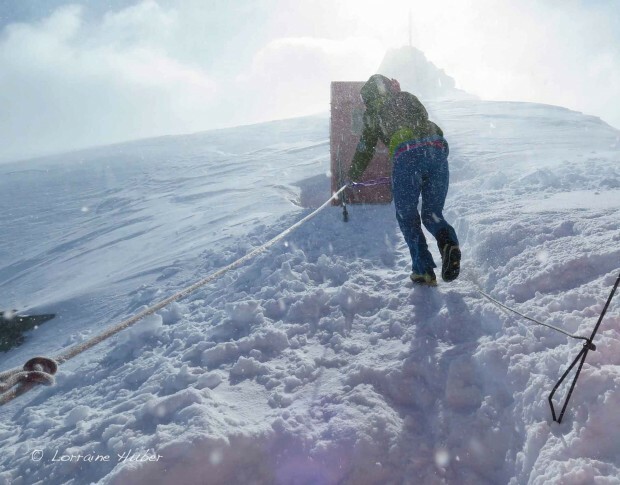 We tie in to a fixed rope to walk a few meters through the storm in order to use the outside toilet. I had to muster all my strength to be able to open the toilet door against the wind. Jono though doesn’t let us get bored. 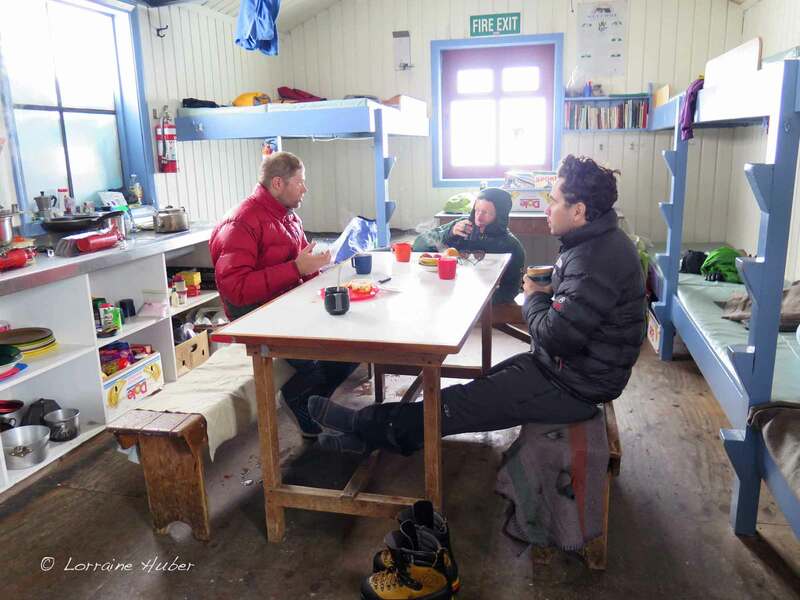 With the hut to ourselves, we spend a couple of hours cleaning the kitchen and disposing of left behind and out-of-date food supplies. Then we delve into practicing building rock anchors and crevasse rescue, as well as orientation, weather, and snow and avalanche awareness theory. Tasman Saddle Hut is comfortable if you have it to yourself. Dress warmly! As soon as the weather breaks, it’s go time. 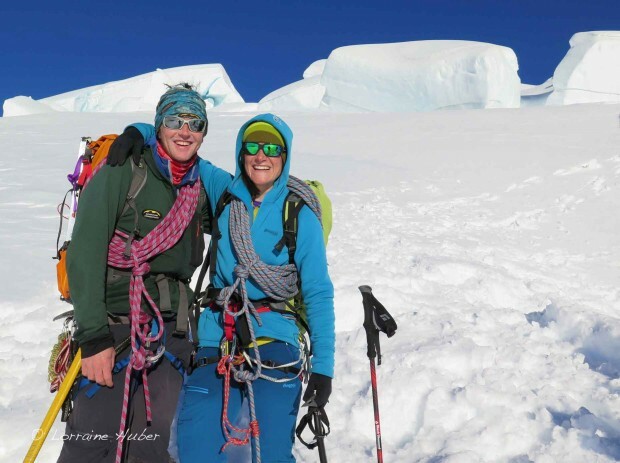 Since it’s too dangerous to climb any peaks due to the extremely wind affected snow, we head down the glacier to some huge seracs and spend the day ice climbing and building ice anchors using ice screws and V-thread anchors. 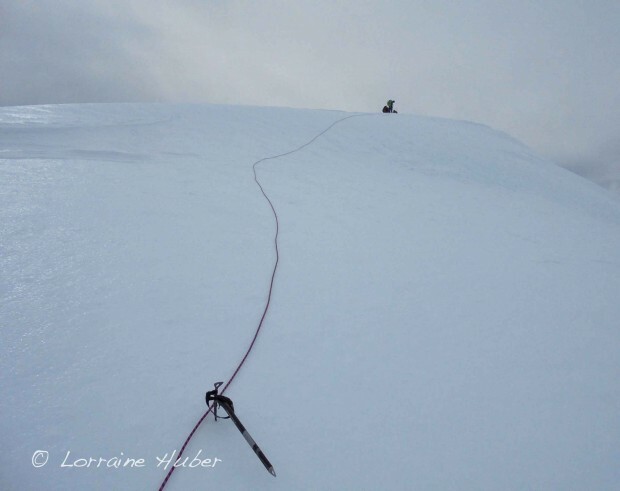 We climb until we are completely saturated from the dripping ice, arriving back at our refuge just before dark. After radioing through to base, we find out that more bad weather is on its way. After a quick meeting and with heavy hearts, our group decides to leave the Tasman in favour of doing some alpine rock in the Remarkables area, where the weather is forecast to be better. We still have one morning of decent weather to play with, so at 4 am we’re up and getting ready to reattempt Hochstetter Dome. 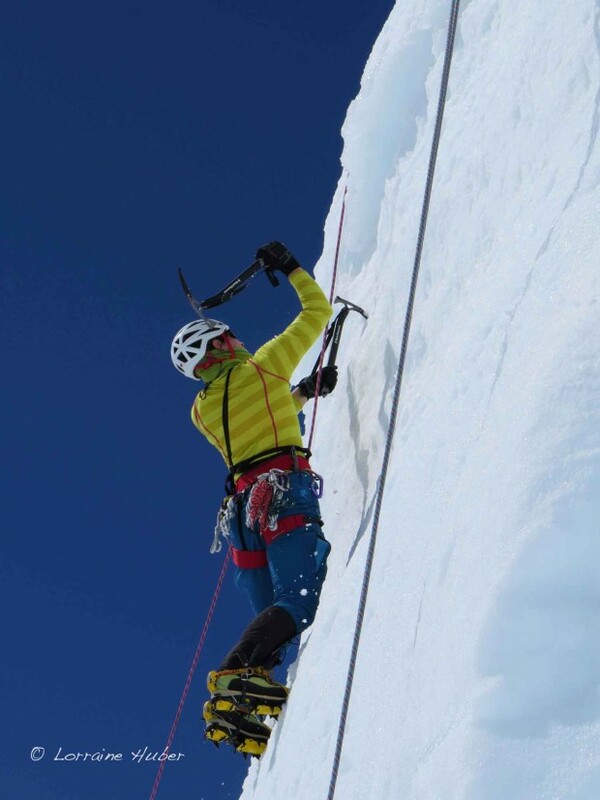 Jono sets a furious pace and pushes us on as fast as possible towards the summit. We don’t have much time and we still need to get back to the hut, call the heli, pack all our gear and supplies together and carry it up to the landing zone before the weather comes in, and it was already coming in, fast. Breathing hard, I hammer a snow stake into the hard snow, top clip with somewhat fumbling fingers and yell to T.J. that he’s on belay. 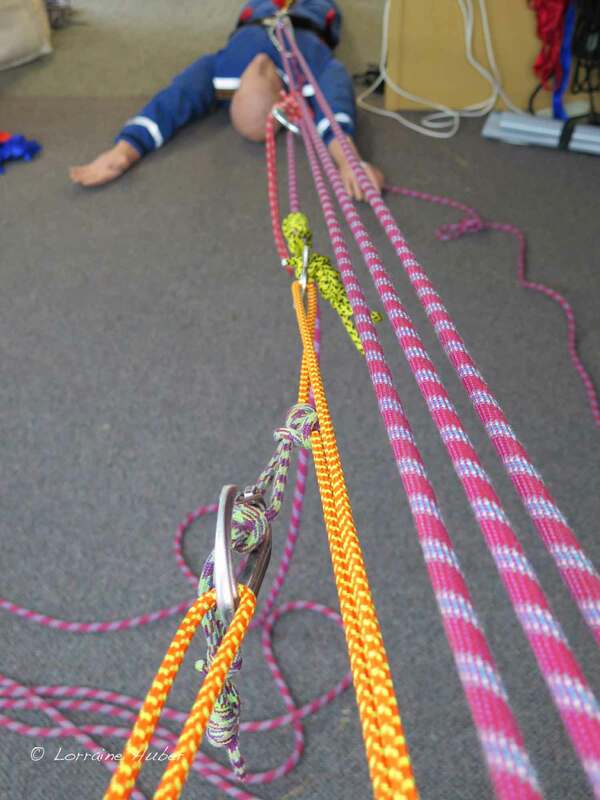 T.J. charges up so fast I have to work hard to pull the rope fast enough through my belay device. Definitely using the Munter hitch on the next pitch. T.J. and I move fast and only speak when necessary, passing the other climbers ahead of us who had camped out in the snow. We finally reach the summit, pausing briefly to admire the view. 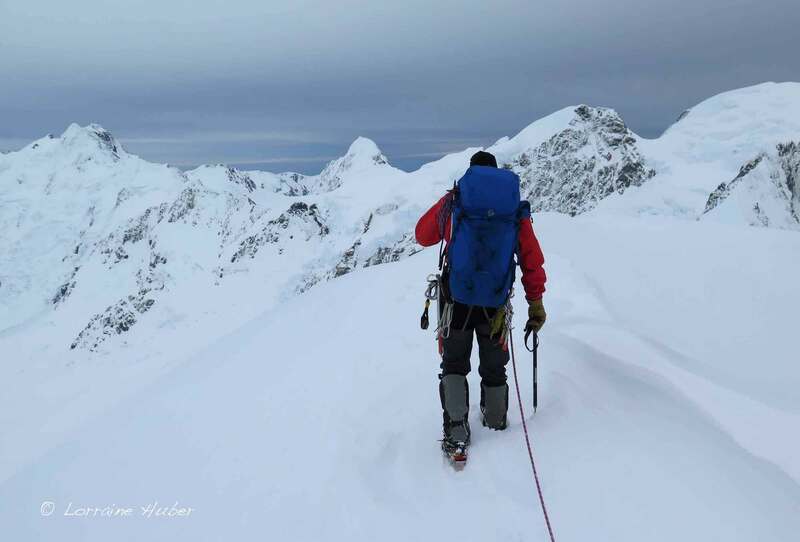 We don’t linger long however, and soon we’re carefully retracing our steps along the very narrow snow ridge, belaying each other back down the icy ridge of Hochstetter Dome. After the ridge, we’re practically sprinting downhill through the knee-deep snow to get to the hut. Poor Denis is roped up with Jono and has to fight to keep up. We make it out of there just in time before the helis are forced to shut down due to a lack of visibility. The evening is spent showering and cooking and eating lots of food. Heavenly! We admire the audacity and skill of the early Mt. Cook climbers at the visitor centre the following morning and then drive back to Queenstown. Although the weather has been tough, the mood in our group is excellent. Jono and T.J. are getting along famously, talking for hours about aviation and flying jets. There is much banter and joking, as well as sets of ten push-ups every time one of us said the word “mine”, which, in Jono’s case, was an awful lot. Upon arrival in Queenstown, we check the weather again and are disheartened to find that it has worsened. 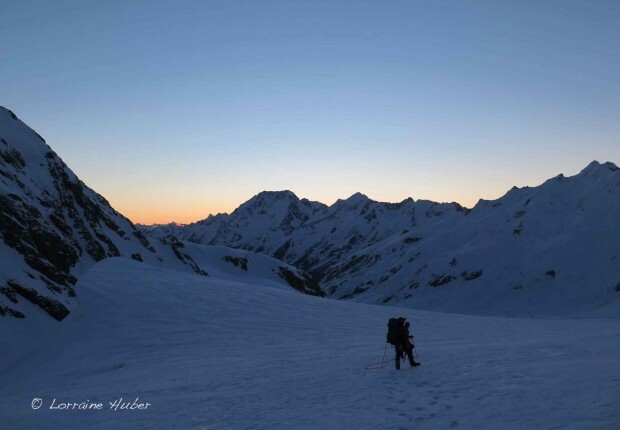 Nevertheless, we decide to use the last days camping out in the Remarkables as planned. 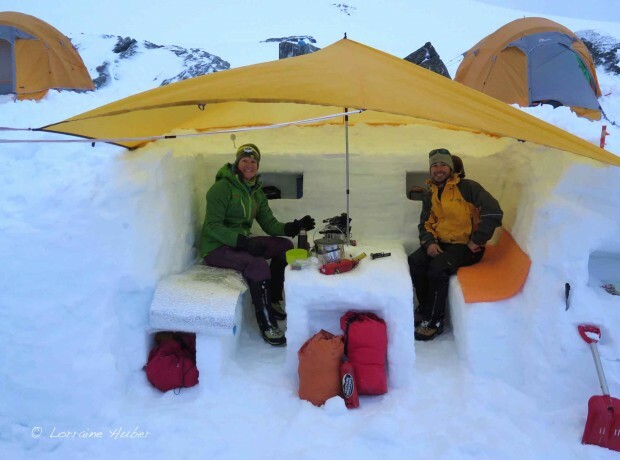 I’m keen to go over expedition camping skills, tenting, snow caving and bivvies too. 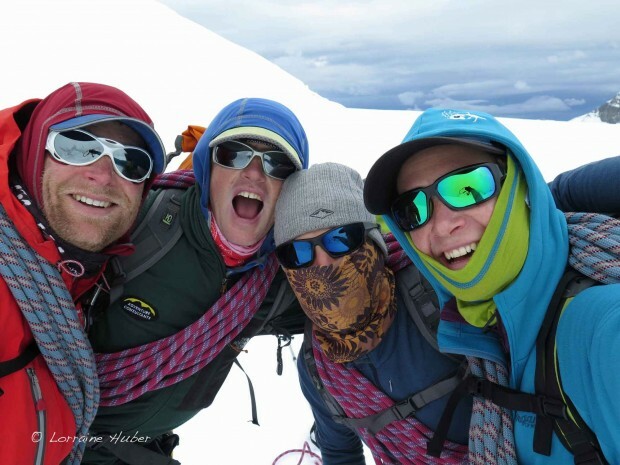 Once again, we are forced to turn back on an attempt to climb Double Cone due to high winds, but it was still such a positive experience. We wrapped the course up with another day spent on Hospital Flat, where Jono teaches me the art of placing nuts and cams. 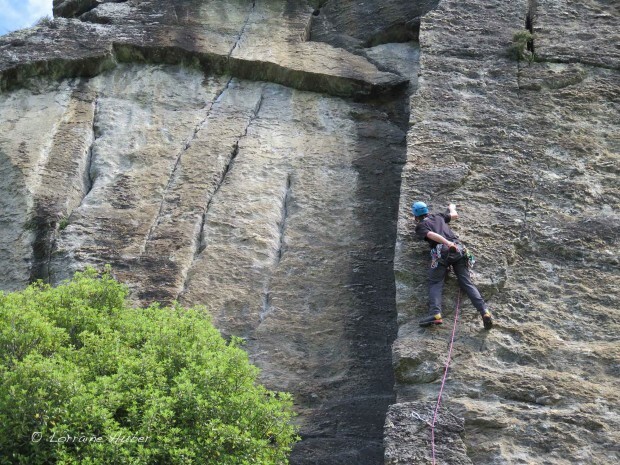 It was a steep learning curve and that day I lead my first trad route, with much encouragement from the boys. Finally, we practiced some advanced self-rescue skills on rock including hauling and lowering, and felt very good about how far we had come indeed. 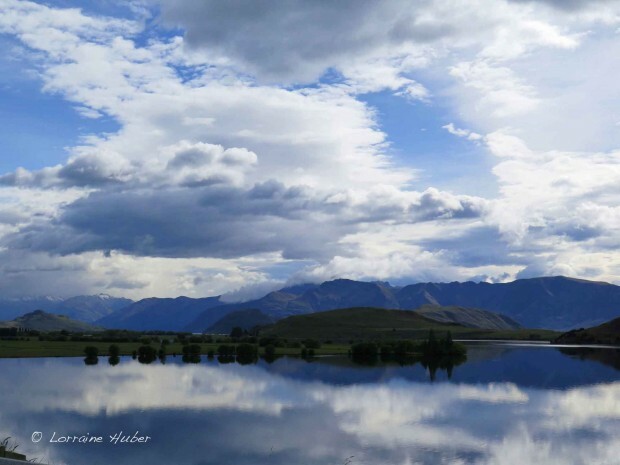 Weather can be difficult in New Zealand, but we were unluckier than most perhaps. But thanks to Jono and his huge efforts to pass on as many skills as he possibly could to us, the Alpine Expedition Course was still a big success. I learnt many new skills and gained a lot of confidence in alpine climbing techniques. Rarely have I laughed as much as during those twelve days, and I have made three new friends for life. After having spent 3 weeks in Wanaka last year, I decided right then and there to do a whole season in this awesome lakeside town located on the South Island of New Zealand. Only a 30 minute drive to Treble Cone, arguably NZ’s best ski resort, Wanaka is to be my home for the next 3 months. Here I will ski and compete in the New Zealand Freeride Series, consisting of: the NZ Freeski Open Big Mountain at Treble Cone, the K2 Big Mountain Chill Series at Craigieburn and Mt. Olympus, and the Export Gold Xtreme at Whakapapa, Mt Ruapehu. 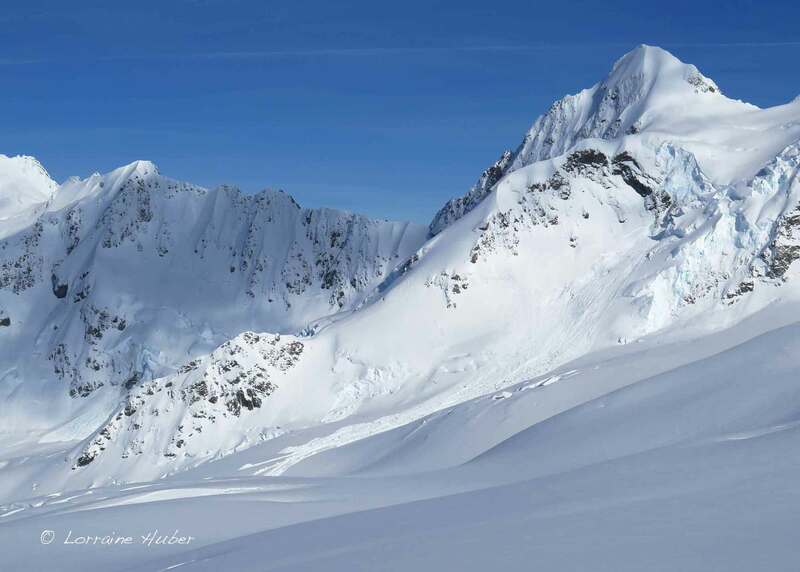 This is the first ever Southern Hemisphere Freeride World Qualifier (FWQ) Event and I’m stoked to be part of it! 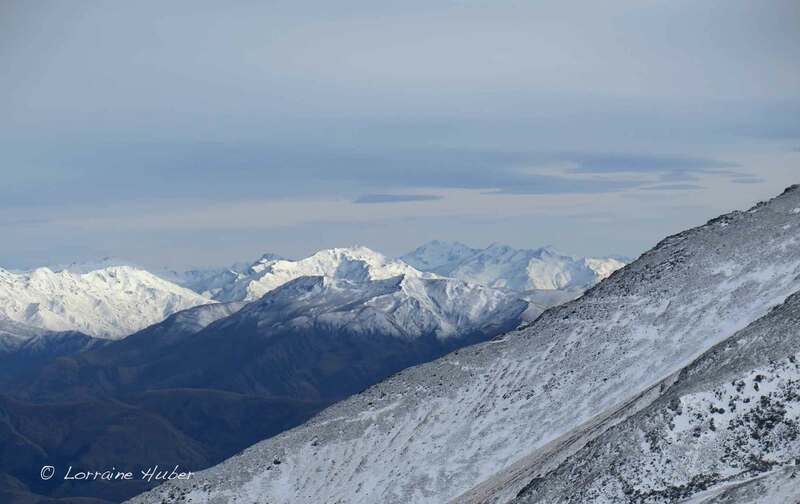 I’m pre-qualified for the big mountain finals for the NZ Freeski Open because I podiumed last year. The finals are on the 14th August, wish me luck!